"Adventure platform game with an addictive and entertaining game play"
This is the rebirth of a legend. Rayman Origins is a platform game that brings back some of the classic characters of Rayman's, released 15 years before. The Glade of Dreams has a been a peaceful place until now. The Darktoons have arrived and started a war. Rayman and his friends will have to fight many different epic bosses in order to stop that critical situation. This is going to be an adventure in which you will laugh with the fun main characters. Collect the pieces of the Glade's history and get them together. That way, you will find out Rayman's origins. 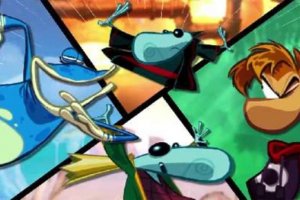 Rayman, his friend Globox, and two magic wizards will be led by you in this 2D video game. You will be able to play on your own in the adventure mode, and 3 more players will have the chance to jump in or out at any time in co-op mode. This platform sidescrolling game has 3 different genres: adventure, beat'em up, and action. Go over 60 levels and 12 different environments in Rayman Origins.